GBA Members may register for $45 until February 9 when registration for everyone goes up to $65. Glad you are joining us for our meeting. Your registration includes a one-year membership in GBA which, among other benefits of membership, will bring you our monthly newsletter for a year. Please register so that we may provide you with lunch, a goody bag and a name tag. There's no cost to you but we need this information. Thanks so much. 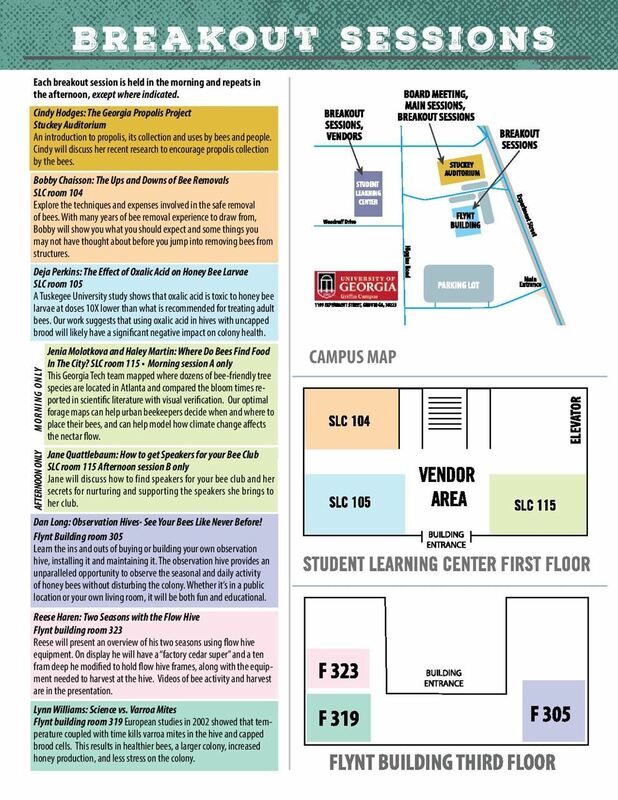 We allow vendors to register for the cost of lunch which is $12 a person. Please register yourself and any helpers. You are also welcome to join us at the dinner with Diana Sammataro, but you do have to sign up for and pay the fee for the dinner, if you choose to join us. 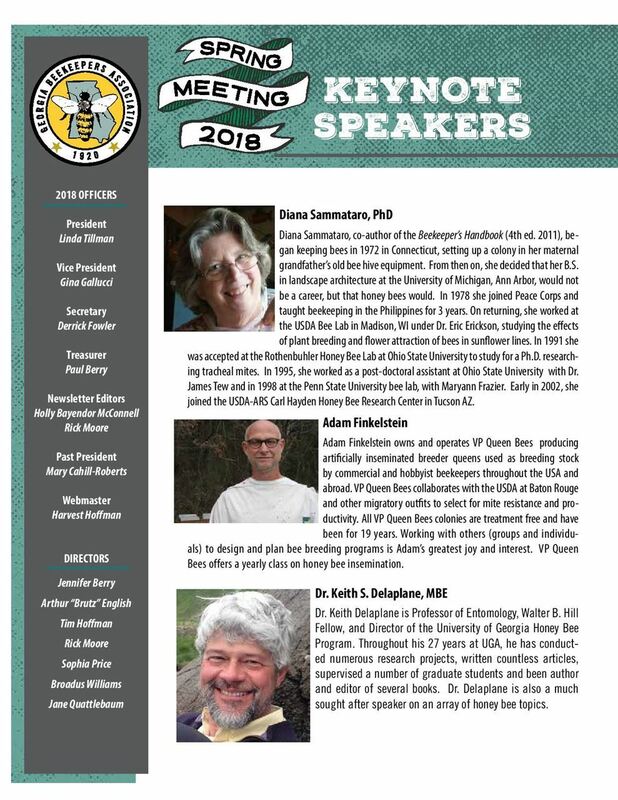 We invite you to register for the conference and be sure to register for the catered dinner on Friday night to connect with beekeeping friends and to hear Dr. Diana Sammataro speak on mites and fungicides. 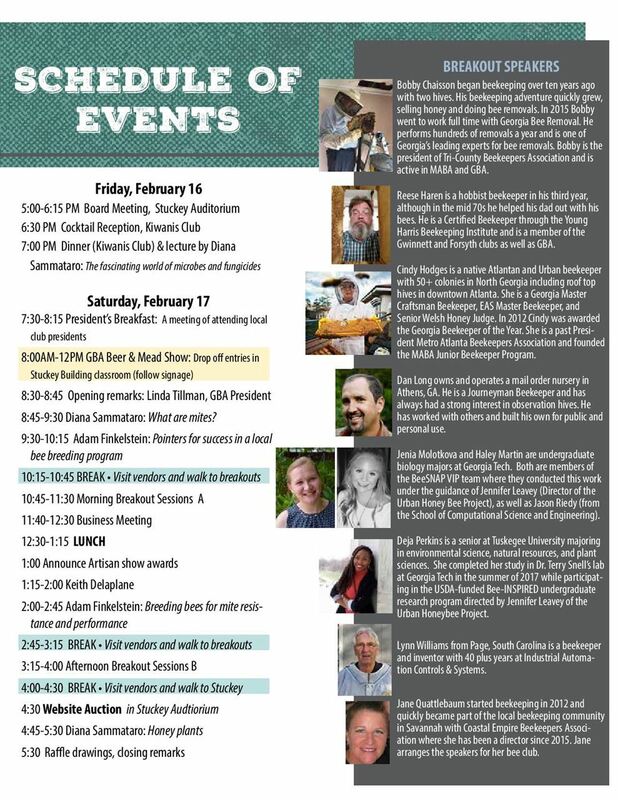 GBA Spring Meeting is full of great speakers, fun beekeeping connections, and an informative dinner. Diana Sammataro, Adam Finkelstein, and Keith Delaplane are our featured speakers. Of course, we will also have interesting Georgia speakers doing breakout sessions throughout Saturday. Some of our regional speakers include Bobby Chaisson, Dan Long, Cindy Hodges, Reese Haren, Lynn Williams, and some Georgia Tech students. Topics will appeal to experienced beekeepers as well as beginners. The cover is above. Scroll down to see the rest of the program. The meeting starts on Friday with the GBA Board meeting. The GBA Board will meet at 5:00 PM. That is earlier than usual because we will have a special dinner event after the board meeting. As we did last spring for the first time, this year on Friday night, we will have a catered dinner and bee lecture by Diana Sammataro. We will have a cash bar and reception which starts at 6:30. The dinner at 7 PM will be held at the Kiwanis Club in Griffin. Dinner will be catered and will include bread, salad, non-alcohol drinks and dessert. The cost of the dinner is $22 a person. We invite all of you to take advantage of this special opportunity to be with each other and to hear Diana speak on the fascinating world of mites and fungicides. 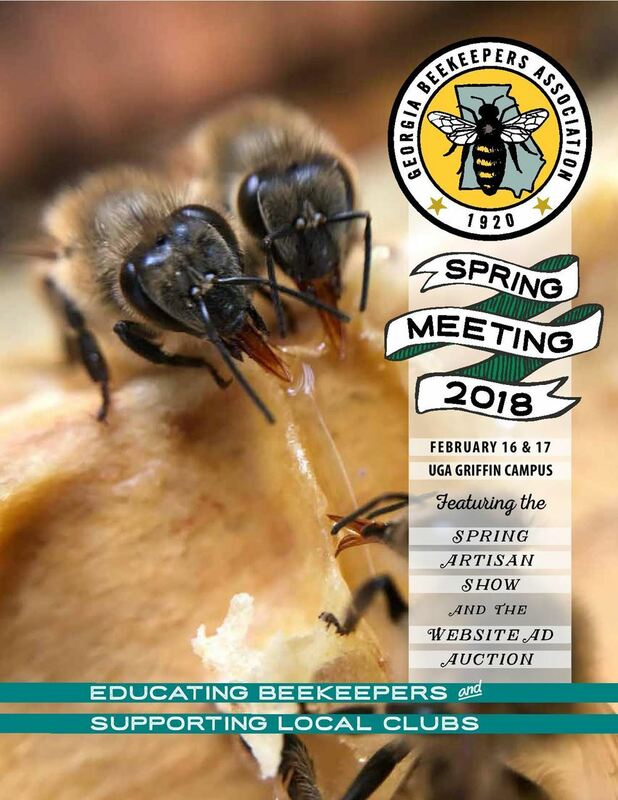 The general spring meeting will take place all day on Saturday, February 17, beginning and ending with talks by Diana Sammataro. In between you can hear Adam Finkelstein, Keith Delaplane and many talented Georgia beekeeping speakers. We will also have a short business meeting in the middle of the day to confirm the revised bylaws. Please do register for the event, and be sure to check your lunch preference for the boxed lunch provided by GBA. Registration for member is $45, including lunch. Registration for non-members is $60, including lunch. Beginning February 10, registration fees for everyone will be $65. We have blocks of rooms reserved at the Country Suite in Griffin, where the speakers and most of the officers will be staying. Other Griffin area motels are the Quality Inn, the Baymont, and the Comfort Inn. All will welcome beekeepers. Be sure to identify yourself as a GBA member. It is probably more helpful to get a discount if you register by phone.